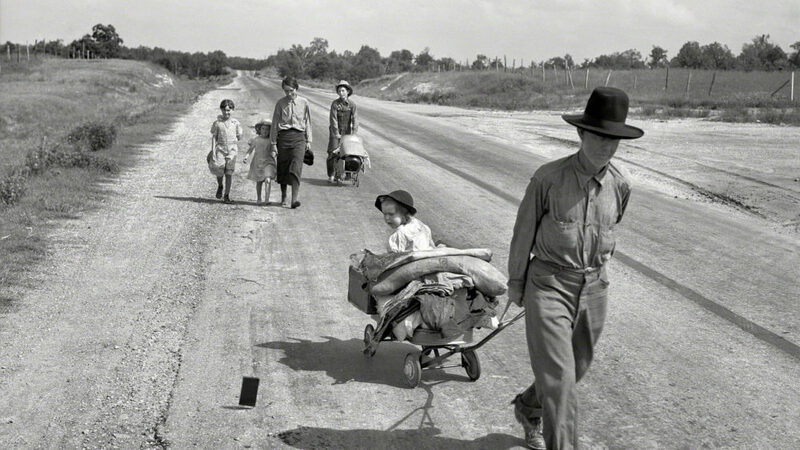 Dorothea Lange, “Family walking on highway, five children” (June 1938) Works Progress Administration, Library of Congress. The wonder of the stock market permeated popular culture in the 1920s. Although it was released during the first year of the Great Depression, the 1930 film High Society Blues captured the speculative hope and prosperity of the previous decade. “I’m in the Market for You,” a popular musical number from the film, even used the stock market as a metaphor for love: You’re going up, up, up in my estimation, / I want a thousand shares of your caresses, too. / We’ll count the hugs and kisses, / When dividends are due, / Cause I’m in the market for you. But, just as the song was being recorded in 1929, the stock market reached the apex of its swift climb, crashed, and brought an abrupt end to the seeming prosperity of the “Roaring ‘20s.” The Great Depression had arrived, and with it, as the following sources chronicle, a rupturing of American life.